In this first year of the First World War centenary commemorations, it’s hard for the MDOs not to notice World War One collections as they work with Queensland’s regional museums and communities. As we write grants and work on a variety of projects, we’re all keenly aware of the importance of these collections and artefacts. Rolls of honour, signature cloths, letters home, knitted socks, soldiers portraits and glass negatives, Dead Man’s pennies, war trophies, equipment guild artefacts and war souvenirs: these are just some of the items that are preserved by volunteers in regional Queensland’s community museums. They are special and significant. They demonstrate the impact of the war on communities, families and individuals. In a recent trip in north west Queensland, Ewen McPhee and Dr Jo Wills came across an extraordinary array of First World War collections and materials. Like other communities across the state, there are some powerful stories from the First World War period that illustrate just how people and townships in north west Queensland were affected by the war – both on the front line and at home. Of particular interest were the signature cloths in Croydon and Cloncurry. Community members paid to have their signatures embroidered onto the cloths as part of patriotic fund raising activities. Some of these were later auctioned off to raise further funds for the war effort. There are a number of these signature cloths in other collections around Australia. One in Alison Homestead in Wyong Shire Council NSW recently survived a fire. Another made by the Neerim South Red Cross Society is held by Museum Victoria. It would be interesting to know which other communities in Queensland hold these cloths in their museums and collections. Croydon Red Cross Society Signature Cloth. The Hughes family from Croydon were involved in the production of this item. Prior to being part of the Croydon Shire Council Heritage Collection at the True Blue Information Centre, it was displayed at the local Club Hotel. Other objects strongly represented in collections include honour rolls and memorial boards. Irvinebank, Croydon and Winton have decorative items that commemorate citizen’s involvement and sacrifice. During their travels out west, Jo and Ewen met up with Central Queensland MDO, Dr Melanie Piddocke, in Winton and found a number of interesting items at the Qantilda Museum at the Waltzing Matilda Centre. 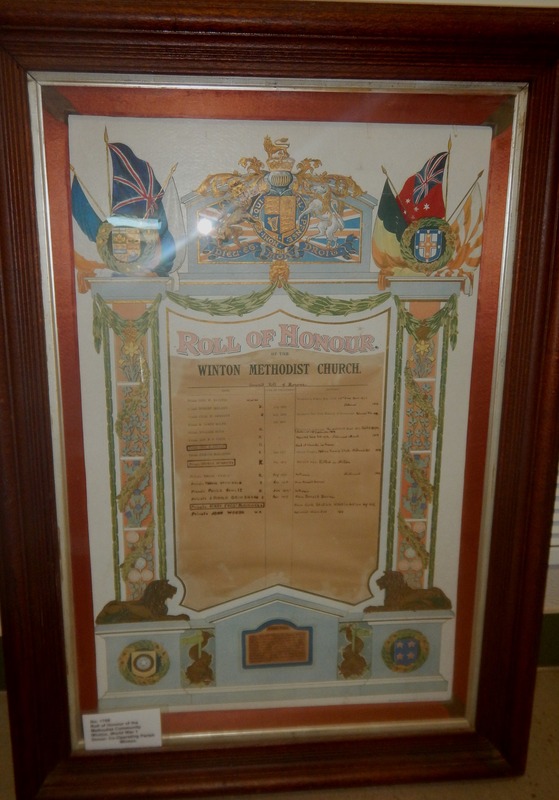 Roll of Honour of the Methodist Community, Winton. A rare and evocative First World War object is held by Zara Clark Museum in Charters Towers. Ewen has previously posted an entry about the pair of half knitted socks and an associated letter that the museum holds. His research into this subject has uncovered related items in other museums, such as the “Grey Sock Booklet’ that was printed by the Soldiers’ Sock Fund to provide instruction for knitting socks. A copy is held in the Powerhouse Museum Collection. Another interesting item can be found at Loudoun House Museum in Irvinebank. Volunteers Tony, Peter and Ellen showed MDOs a trench mortar presented to the community as a war trophy. Numerous communities were presented with trophies captured from German troops on the front line. Trench mortar presented to Irvinebank community as a war trophy. Loudoun House Museum, Irvinebank. Photo: Peter Shimmin, Loudoun House Museum, Irvinebank. Thanks to all of the volunteers, museums and council officers in Charters Towers, Hughenden, Winton, Cloncurry, Mount Isa, Burketown, Normanton, Croydon and Irvinebank for making us welcome and sharing information about your heritage and collections. 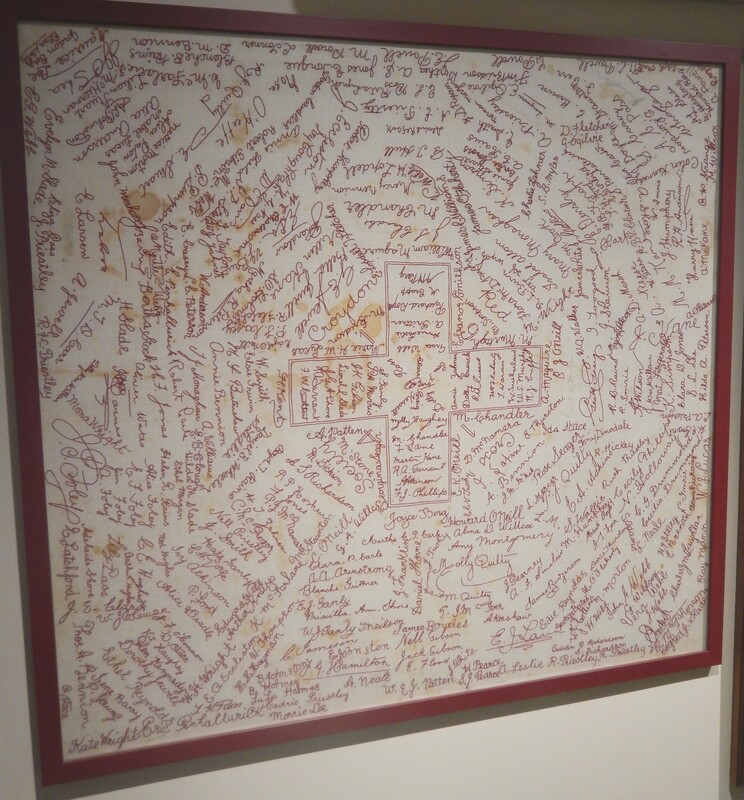 Posted on 18 November 2014, in Jo's Diary, Uncategorized and tagged ANZAC, Central Queensland, croydon, ewen, Far North Queensland;, First World War, honour roll, Irvinebank, Jo, Loudoun House, Melanie, North Queensland, Qantilda Centre, signature cloth, True Blue Visitor Information Centre, war trophy, Winton. Bookmark the permalink. 1 Comment. The Irvinebank war trophy is a German 7.58cm lMW nA # 2642. It was captured by the AIF’s 41st Battlaion. 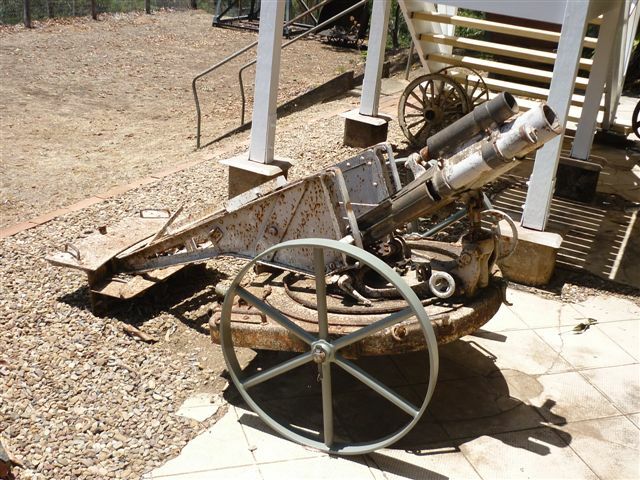 You’ll find a complete listing of these Queensland mortar allocations at http://artilleryhistory.org/artillery_register/directory_of_allocated_minenwerfer_war_trophies_ww1_queensland.html . As an aside, only three of Australia’s 64 Great War Victoria Crosses were awarded to Queenslanders one of whom, Sergeant Harry Dalziel, came from Irvinebank (see also http://trove.nla.gov.au/ndp/del/article/20264696?searchTerm=Irvinebank war trophy&searchLimits=exactPhrase|||anyWords|||notWords|||requestHandler|||dateFrom=1919-01-01|||dateTo=1923-12-31|||l-advstate=Queensland|||sortby ).